Due to the recent downturn of home prices over the past several years a large percentage of homes in the Riverside County area are still being ‘taxed’ based on much higher property values prior to this decline. 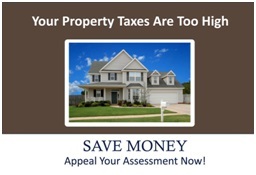 So there’s a very good chance you’re paying more than your fair share of property taxes! That’s where Choice Appraisal Services, LLC comes in. There are a lot of different procedures for appealing tax assessments so it’s important to enlist the help of a professional appraisal company that’s experienced and trained in the ins and outs of the appeal process.